I know this is Julia’s slogan but it means a lot to all Australians, including us. We need to move forward at a rather cracking pace now. We have spent a lot of time visiting friends and this has been really wonderful (3 Ukuleles on our recently devised Bikelele rating system, similar to the familiar but soon to be outmoded Michelin rating). We have now pretty much run out of friends, unless we can make some new ones. Fabian was an excellent host in every way and his parents were welcoming and hospitable. Now we are on our own with the most challenging part of the trip ahead. We took a train from Kaufbeuren to Regensburg, a magnificent old city on the Donau. There is too much historical information to take in, so we have a nibble rather than a full meal. We visited the cathedral, then just wandered around the narrow streets and found our way to the river. The water levels are high due to rain and floods to the north and the river is muddy and fast flowing. The radweg (bike path) is mostly flat, so we covered a good distance despite starting after midday. 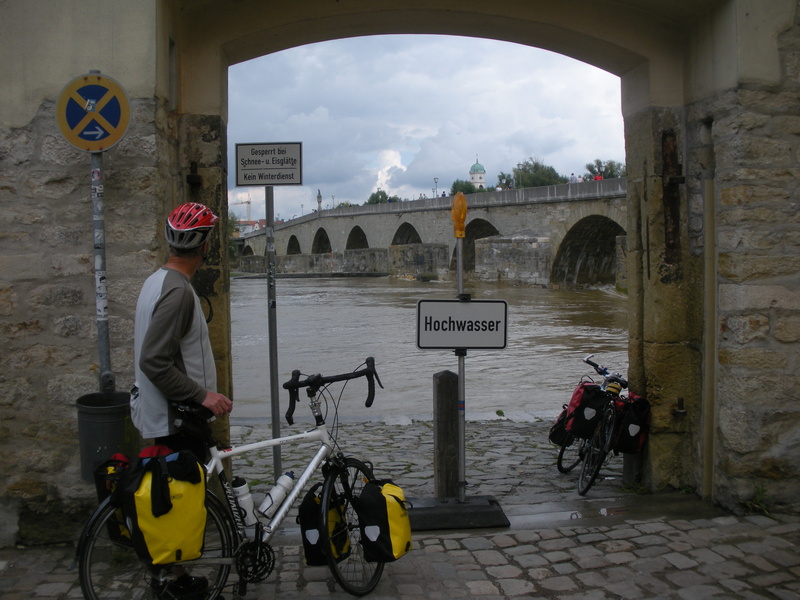 Notable sights include: Wahalla; cornfields; gold Jesus on the cross on a church; many cyclists travelling in both directions; the beautiful towns of Straubing where we had lunch and Deggendorf where we are staying in small pension overlooking the river. This entry was posted on 11 August 2010 at 7:28 am and is filed under Germany. You can follow any responses to this entry through the RSS 2.0 feed. You can leave a response, or trackback from your own site.